After a 2016 that saw Guns N’ Roses perform for more than 1.8 million people and gross $192 million at the box office, the money train that is the band’s reunion tour resumed in January with shows in Japan. The trio of Axl Rose, Slash and Duff McKagan were joined by AC/DC’s Angus Young for a series of guest appearances during an Australian run in February, including back-to-back nights in Sydney on February 10 and February 11, and in Melbourne on February 14. On a short break from the tour, Rose joined Billy Joel to perform the 1979 AC/DC classic, “Highway To Hell”, at Dodger Stadium in Los Angeles on May 13. In June, guitarist Richard Fortus revealed that the band have been working on material for a new studio album. Angus Young joined Guns N’ Roses again for a few shows on their European tour, including appearances in Hannover, Germany on June 22 and a July 12 stop in Nijmegen, Netherlands. In July, a mid-year report by live industry magazine Pollstar revealed that the group had the highest-grossing worldwide tour in 2017, earning an industry-leading $151.5 million gross from January 1 to June 30. Ahead of a summer North American tour, the band performed an intimate invitation-only concert at New York’s Apollo Theater on July 20 that was broadcast live via satellite radio. Guns N’ Roses opened a summer run in St. Louis, MO on July 27 with a marathon 31-song show that lasted 3.5 hours before 37,000 fans at The Dome At America’s Center. The next day, Rose regrouped with Billy Joel for another take on “Highway To Hell” in Minneapolis, MN ahead of the group’s concert in the city. In August, Slash was named the first-ever Global Brand Ambassador for Gibson; his signature sound and epic solos were recorded with several of his favorite Gibson guitars. Guns N’ Roses performed rare covers of classic tracks by Glen Campbell and James Brown during their August 30 date at Commonwealth Stadium in Edmonton, AB, one of the final shows on the North American summer stadium run that delivered another $53 million in revenue to push the Not In This Lifetime tour over the $200 million mark in 2017 and more than $300 million since its launch in April of 2016. Guns N’ Roses performed the AC/DC classic, “Whole Lotta Rosie”, in Hartford, CT on October 23 as a tribute to the Australian band’s late producer George Young – the older brother of AC/DC guitarists Angus and Malcolm Young – who passed away on October 22 at the age of 70. A few weeks later, Rose and company performed a tribute to Malcolm Young during their November 18 date in Sacramento, CA following the guitarist’s passing that day at the age of 64 following a long battle with dementia. The fall run featured a pair of guest appearances, including ZZ Top guitarist Billy Gibbons in Houston, TX on November 10 and head Foo Fighter Dave Grohl in Tulsa, OK on November 14. 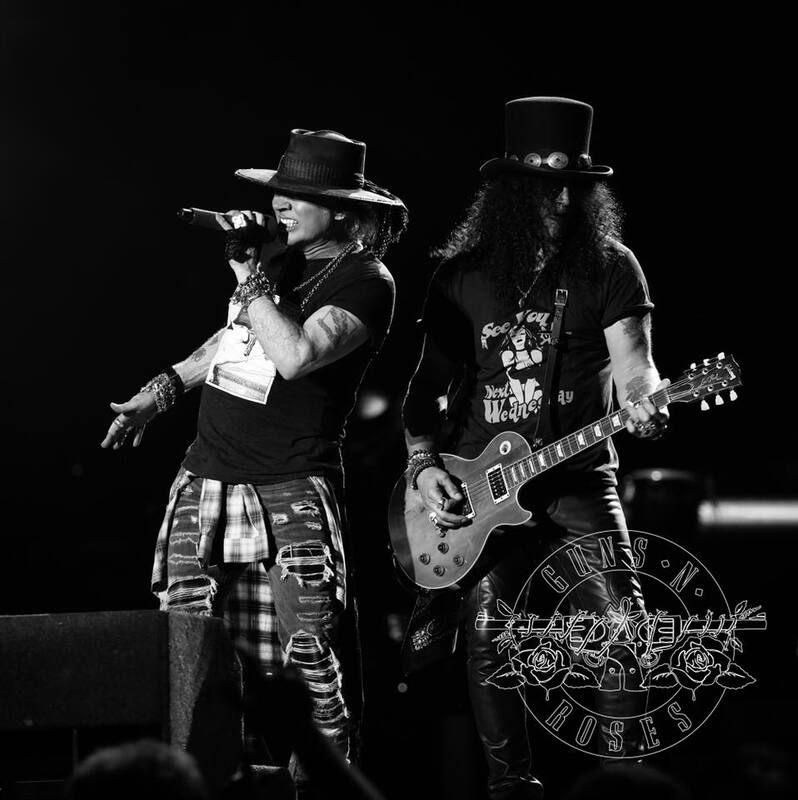 GNR wrapped up their 2017 live schedule with a marathon 37-song performance at The Forum in Los Angeles that clocked in at almost 4 hours and was broadcast on satellite radio. Rose, Slash and McKagan have extended the reunion tour into a third year with the addition of summer 2018 concert dates across Europe that will begin in Berlin, Germany on June 3.